I was having a craving for something fried, but didn’t want to go completely crazy and actually eat something fried. Whew, since fried things taste so bad! Ha! Falafel is kind of like a hush puppy, but it’s made with chickpeas instead of cornmeal. The flavors are quite satisfactory and it goes great with Annie’s Goddess Dressing (because it’s full of tasty tahini!). Preheat oven to 380°. Chop parsley, and onions and add to blender. Drain the canned chickpeas well then add to blender along with lemon juice, cumin, garlic, baking soda, salt, and pepper. Pulse until everything is paste-like. You will most likely have to stop and scrape down the sides several times as you go. Add a tablespoon of water at a time if it’s getting too hard to mix, but don’t exceed 4 tablespoons. When everything is fully pureed, remove from blender and place in a bowl to add the flour. When I made mine tonight it was just a little too wet. If it’s too wet, this is when you’ll need to do the flour thing like this. Just mix it in until the balls hold together a little better. Coat a cookie sheet with 2 tbsp of oil. Scoop out the chickpea mixture and gently shape it into a ball as best you can and place it on the cookie sheet. I think this made like 30 falafels. Brush the top of each little ball with more oil and bake for 15 minutes on each side. Chop veggies as required, mix together with salt and olive oil. 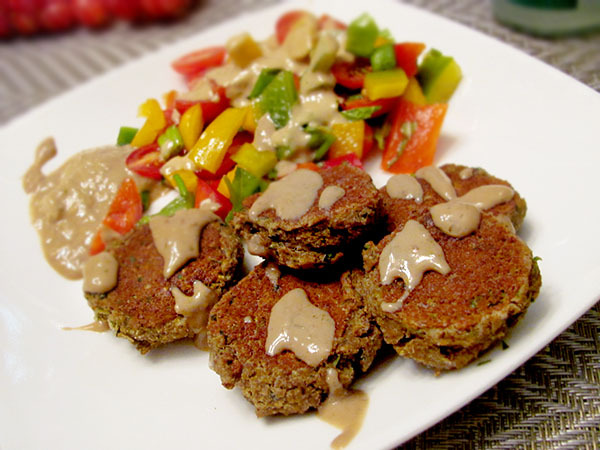 Serve falafels along with the salad, topped with a generous drizzle of Annie Goddess Dressing. Tahini-licious!!! !